The entire Kyocera range (including the devices on this website), will work with Kyocera’s Mobile Print functionality application. The Kyocera Mobile Print app puts YOU in control of your document imaging, eliminating the need to carry cumbersome printed files on the chance you need them. 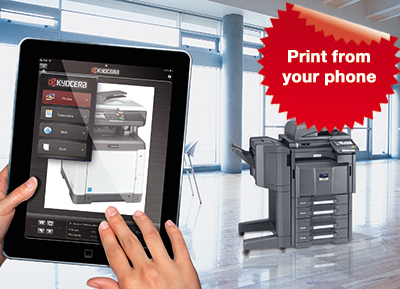 Connect your mobile device to the same Wi-Fi network as the Kyocera MFP or Printer you will be using to print. Use the Mobile Print app to open the document, image or web page you wish to print.